Alright guys, I have a different sort of valentine for you. 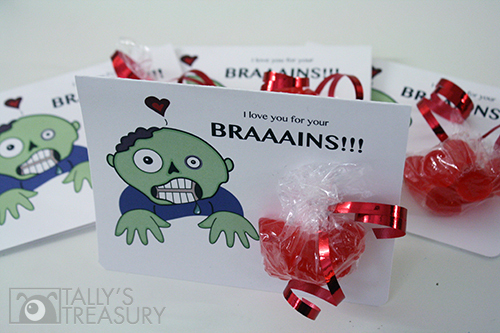 It’s perfect for those with a love for intellect, puns, gummy candies and the drooling, shambling, gently oozing undead. I’m woefully not at all pro-level-awesome at digital drawing, but I still think this image turned out pretty cute, so I’m posting it as a downloadable PDF for any of you who want to use it. Below is a listing of 4 PDFs – I’ve made some variations to provide options. If you want to print a traditional folding card, print PDF a, which has 2 images per page so you can cut the page in half and fold each half over to form a card. 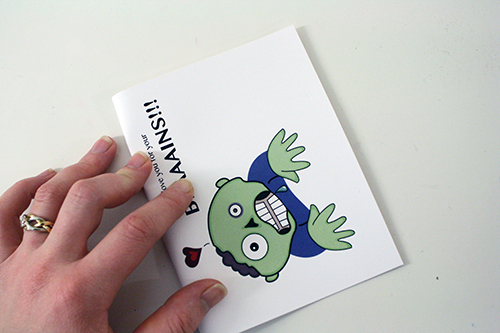 If you want just a plain flat card (you can always write a personal message on the back), go with PDF b, which has 4 zombie images to a page. 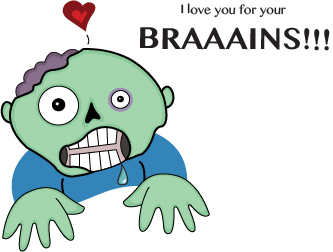 I’ve also created PDFs of these same options – 2 images per page and 4 images per page – that say “I like you for your brains,” just in case some of you have kids who want to use these at school or something. 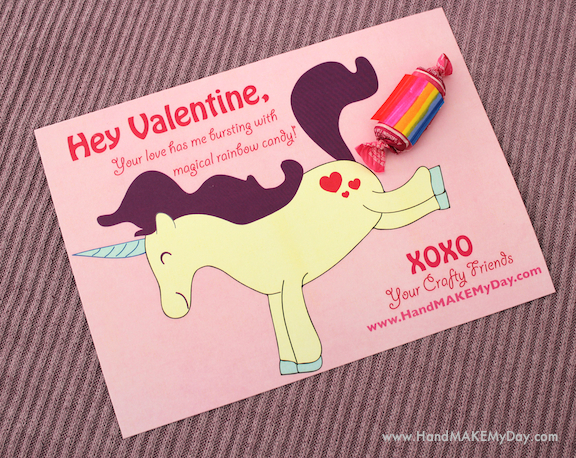 Go around telling all the other kids you “love” them, even on a silly mass printed Valentine’s Day card, and you’re just asking for unneeded hassling. I remember elementary school. Anyway, those are PDFs c (2 per page) and d (4 per page). 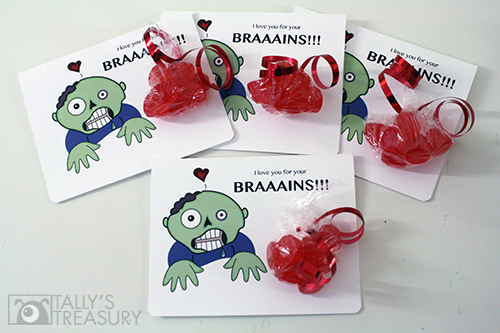 Continue on below for instructions (this really doesn’t qualify as a “tutorial” given how exceedingly quick and simple it is) on attaching little bags of candies to the cards, if desired. 1) Get the PDF of your choice printed out on white cardstock, then slice them in half (or in 4, depending) and fold them in half if you’re using the folding card option. 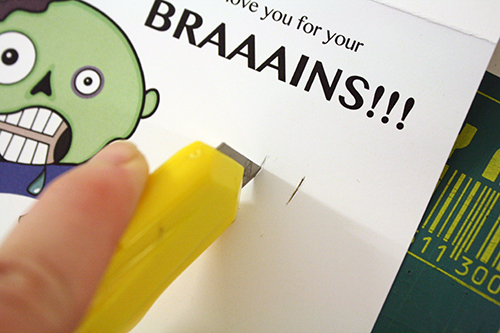 3) Going back to the card itself, use an xacto knife (with something underneath to protect your table top!) 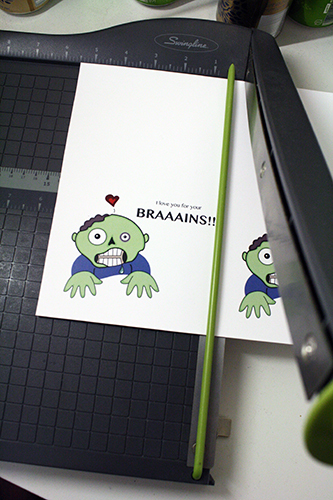 to cut two small slices in the card. 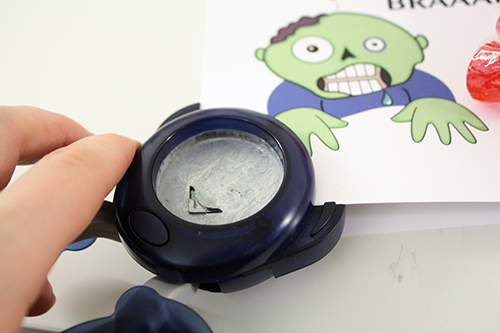 4) Cut a small piece of ribbon and insert its ends through the cuts, so the ribbon ends poke out the front of the card. 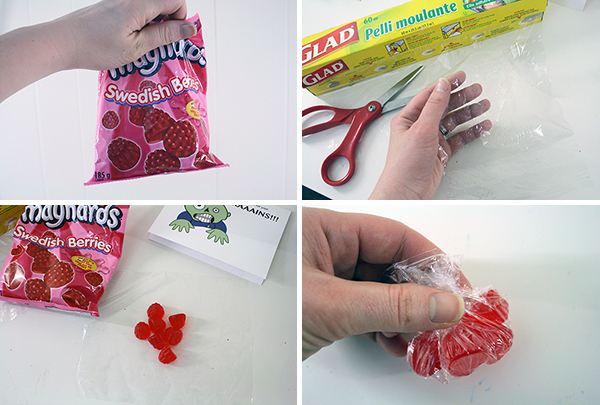 Then tie them around the candies you wish to attach. Use your scissors to curl the ribbon ends. [optional] Use a corner rounding tool to trim the corners of each card. I’m a little obsessed with this practice lately, having acquired a corner rounding tool a while back. I like the softer, finished look it gives cards. But that is entirely a matter of personal taste. 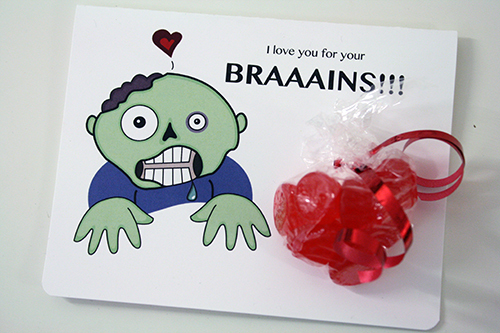 Then, come Valentine’s Day, show the special people in your life how much you care! Wonderful blog! I ffound it while searching on Yahoo News. Do you have any tups on how to get listed inn Yahoo News? I’ve been trying foor a while but I never seem to get there!